2MV Logistics is a leading specialist in regional, national and international road freight. We're ideally placed for access to the A3, the M27 and links to London and the South-West. We serve national and blue chip companies, international corporations and businesses local to us in the Hampshire, West Sussex and Dorset areas. No matter the size of the client or the load, 2MV offers a friendly, professional and utterly reliable service. We run a modern, emissions-friendly and diverse fleet of full weight artics with double and single deck trailers. Our collection and delivery vehicles, including curtainsiders and rigid vehicles between 18 and 7.5 tonne gross weight, are all tail-lift equipped; and we also have vans for smaller deliveries or areas with restricted access. 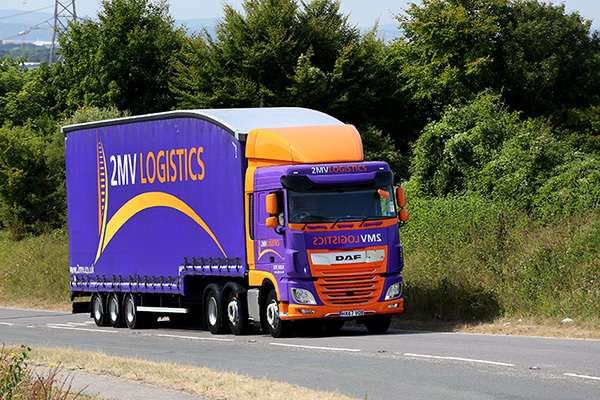 2MV can offer a full range of road transport and haulage services, from same day man-and-van deliveries to full load haulage. Our highly experienced team will find the most cost-effective method for you to transport your goods to their end point depending upon your timescales, load type, load weight and any other relevant factors. For instance, we can take full trailer loads or offer part-load consolidation with other customers, which cuts the cost and environmental impact of delivery. If you have small palletised loads or delivery of pallets throughout the UK, we can use THE Pallet Network for the most cost-effective and green method of national distribution, whether it's overnight a timed delivery or an economy service. For that delivery which absolutely has to get there today - we'll make it happen. Our domestic courier service covers the whole of the UK, Ireland, the Channel Islands, the Isle of Wight and the Isle of Man. It includes booked or timed deliveries and Saturday deliveries. All consignments will generate an electronic proof of delivery (ePOD) on arrival at their destination. Although 2MV has substantial road haulage resources of its own, we also have access, should you ever need them, to more than 100 regional distribution and haulage specialists who are our co-Members in TPN. There are more than 120 depots we work with daily, are audited to high standards and that we regularly trust with our clients' freight through the TPN network. So if you ever need, for instance, a load shifting from one side of Scotland to the other, we will still know exactly the team for the job. AT 2MV we'll take care of you, your freight and your customer. Whatever the job, wherever the destination. We'll be there.